You are cordially invited to join us for a journey of brotherhood and camaraderie! Club & Unit Presidents: Please have a representative present for our Fezzing to express what your Club or Unit does to support the Fraternity and our Philanthropy. This is a great opportunity for all Nobles of El Katif, Calam, Gizeh and Masada to join the fun of bringing new Nobles, their Ladies and families into our organization with pride! Make sure to call in your reservations for this special day by November 12, close of business. 7:00 PM Banquet Dinner ($35 USD /person); Fezzing; Celebration! You must register for this event with your local temple! Special rates have been established at the Centennial Hotel (formerly Red Lion at The Park). 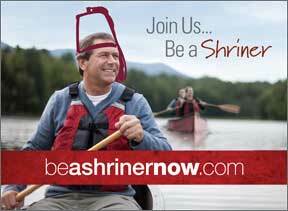 Ask for the Shrine rate of $109 plus tax and fees – US dollars). First come, first served! 509.326.8000. Dress Code for this function is dressy casual for the day; business formal for the evening. For Nobles living on the Island or Lower Mainland arrangements have been made, subject to the number of passengers, to take a bus.